Damn you Loop Hole Week LaLD Engine Week! I found a way but someone beat me to it! Somewhat. At least using the same car. PHILIP!!! But, I didn’t use LEGO as Philip did. I was planning on using a kit by Herpa. Same scale as the cast itself: 1/43. But the engine proved not to be that much of a visible engine so I’m not totally satisfied. See? Some inlet tubing. Intercoolers. No block though. I could add something to the right though. A Jag V12 positioned this way not giving away it’s all 12 cylinders. The cast isn’t a cast actually. It’s some sort of Kyosho. DNANO. Deoxyribonucleic NANO. Weighs next to nothing. No interior and very dark windows. But no F40 has such a high ride height up front I suppose? Or is it just the angle? It ain’t that bad in the shot above. 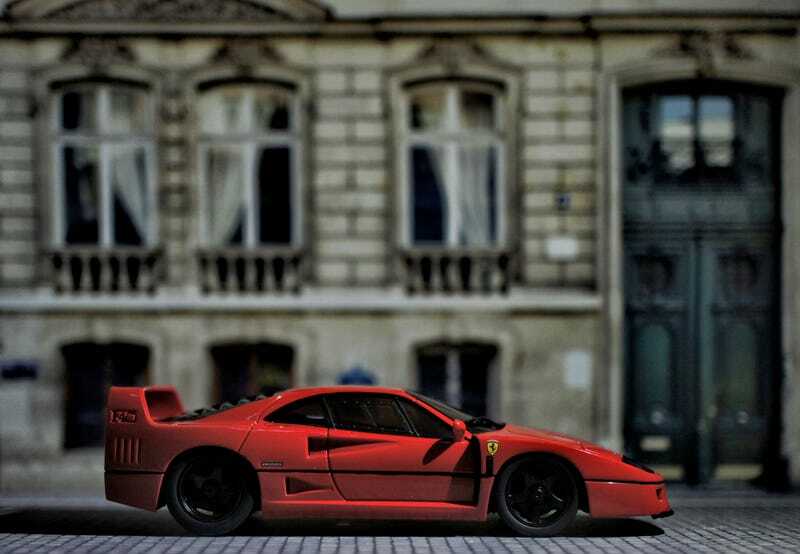 Yet other details are amazing, just look at the badges and the casted F40 in the rear wing. I never realised that was just on the passenger’s side but apparently it is! And that’s it for today as I really don’t have to tell anything about this one now do I? I’m sure many of us had this one on their bedroom wall in our younger years and yes: it has a V8. Ciao e grazie, ragazze e ragazzi!